“The Olympics!” Penny Scott could hardly believe her ears. For a nurse who loved sports, enjoyed travel, craved adventure, what could be more wonderful than an assignment to the Olympic team. The position was all she had dreamed it would be — and more! In the breathtaking setting of the French Alps, surrounded by happy young people her own age and working at the side of a charming young physician, Penny was sure life could hold nothing better for her. Only gradually did she realize that there could be problems, even deadly dangers, in the life at Chamonix. It was the strange, impetuous behavior of skier Ron Reilly that disturbed her first. Later came the dread cry of “Avalanche!” to spread terror in the village. And finally, with the disappearance of her little friend Pierre, there came a need for such daring, such reckless bravery as Penny had never believed she could command. 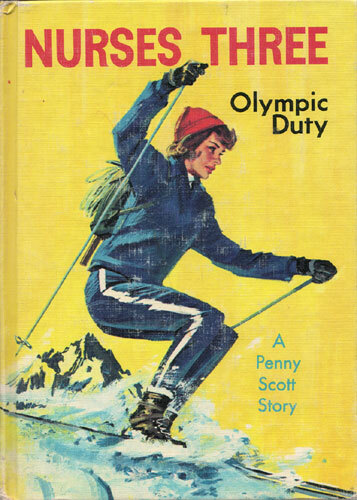 The suspense, the fun, the heartbreak of Olympic competition form a thrilling background for Penny’s first overseas assignment. The Old World is her new world to conquer, and conquer it she does, with the warmth and courage that make her a fine nurse and a memorable person.